This guide will run through all the functionality of the timesheet page. The above example illustrates some typical timesheet data. We can see Alice Tomson has worked 3 shift. The Dates of the shift and the Clock on and Clock off time are displayed. The Howi column illustrate how the shift was created. There is no need to memorise this table as you can mouse over any of the icons for a description. How is timesheet data generated? The data in the timesheet can be created many different ways. The clock on/off guide describes how the employee can clock their worked hours. 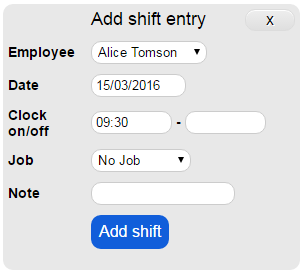 You can also manually create an entry or generate the timesheet data from roster. An entry can be manually created using the above form, most of these fields are self explanatory. The Job title and Description are used to track jobs and for calculating hours for invoicing, they are not required. The filter can be quickly used to find an entry. By default the current fiscal year and working week will be selected. A group can be selected to show only the employees who are a part of that group, when a group is selected this will also affect the employee filter list. An individual employee can also be selected. The form will be automatically submitted when a changed is detected. Adjustments will need to be made to the timesheet. Click the Edit button and a form will appear in line that will allow you to make changes. For this example Alice Tomson started work at 8:30am, however she clocked on at 9:00am. Make this change to the Clock on time and click Update. Note: All times are in 24 hour time. The new time has been saved and new total hours automatically calculated. We can also see who made this change and what the original entry was by mousing over the orange clock on time. Note: There is a script that runs at midnight that checks for any employees that have not clocked out. If your employees work past midnight then this script can be turned off. An employee can work past midnight. The system will acknowledge this has occurred and calculate a total of 8 hours worked (4 to midnight and 4 past midnight). All your shift rules will still function.